I’m not a big fan of Meryl Streep. Obviously she’s a good actress and has done some very fine work – but I find it difficult to watch many of her performances without thinking that they are too visible, too clearly acted for my tastes. Streep is too much of an institution to vanish behind her roles, something that I also feel with respect to many of Robert de Niro’s performances in the last ten years or so. Having said that, though, I very much liked Streep’s performance in the HBO miniseries Angels in America – or should I say, her performances? As was the case in the original stage play by Tony Kushner, most of the roles were doubled, with actors playing two or three different parts. It’s something I enjoy in stage plays, but it rarely works in film, which tends to be too caught up in presenting a realistic surface while sneaking the most outrageously unrealistic plot elements by us. 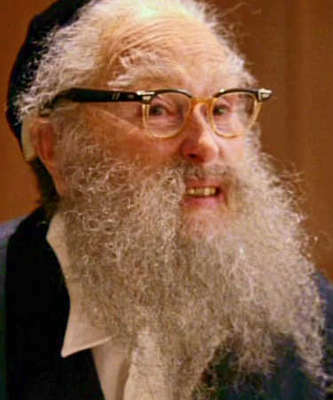 Angels in America, Part I: “Millennium Approaches” starts with a funeral sermon delivered by an ancient, doddering rabbi, played by Ms. Streep. Yes, it’s showy – we can make up one of the preeminent American actresses so she looks like nothing like herself! – but it works. There’s a lot about “Millennium Approaches” that works. The cast is pretty much perfect, my favourites probably being Patrick Wilson’s Joe (I’ve liked him in every role I’ve seen him in so far), Mary Louise Parker’s Harper and Jeffrey Wright’s Belize. Under Mike Nichols’ direction the play translates very well to the small screen; the humour and the pathos are all there and highly effective. After watching the first part, I was all geared up for part II, “Perestroika”. I’d read both plays years ago; I did an amateur production of “Millennium Approaches” in 2000, and afterwards we did a reading of “Perestroika”. Back then I thought it was the weaker of the two, failing to do a satisfying pay-off to the cliffhanger ending of the first play. However, I didn’t expect “Perestroika” to fall on its face with quite as resounding a thud. Yes, there were elements of camp melodrama in the first three hours of Angels in America, but they were pulled off well. Part II, however, descends into scenes that would have made Ken Russell embarrassed. The actors try their best, but some scenes – especially the ones featuring the angel whose appearance “Millennium Approaches” leads up to – are cringeworthy. There may be some way to make lines such as “The blood-pump of creation! Holy estrus! Holy orifice!” and groin-bumping scenes between Meryl Streep and Emma Thompson work, but if there is, Nichols hasn’t found it. It’s not just the HBO production, mind you; Kushner’s original play falters badly in the second part. There are still some strong scenes (especially the ones that eschew operatic metaphysics), but the script becomes prone to hamfisted speechifying. I’ve rarely seen a play, film or series that does so well in the first part and fails so badly in the second part. And based on what I’ve seen, I am very glad that we decided to leave it at the evocative cliffhanger at the end of “Millennium Approaches”. The thought of making people I like deliver those lines… Nothing angelic about that. P.S. : One thing I liked from beginning to end, though: Thomas Newman’s score.